Place petroleum jelly on the skin around the nails that have super glue on them. Apply the jelly liberally, as this will protect your skin from the removal product. Pour acetone nail polish remover into an old glass bowl. It should be about 1-inch deep. Set a timer for 10 minutes. It helps to have a timer that is within arm's reach so you do not have to get up to turn it off. Place the affected nails into the bowl of acetone. Avoid submerging the entire finger--just get the fingernails wet. Remove your nails from the bowl after 10 minutes. You can gently blot your fingertips dry with a towel but do not completely remove the acetone from the fingernails. 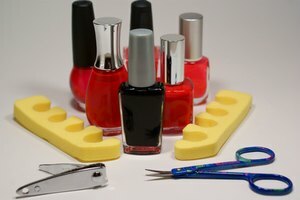 Use a cuticle pusher to scrape off the super glue that has dissolved. Most likely, all of the glue will not come off at this time. Soak your fingernails for another 10 minutes, then scrape off more of the super glue. Continue this process until you have peeled away all the layers of glue from your nails. It may take up to five times of repeating this process. Wash your hands with soap and water to remove the petroleum jelly and acetone. Use a nail buffer to smooth out any rough spots on your fingernails.